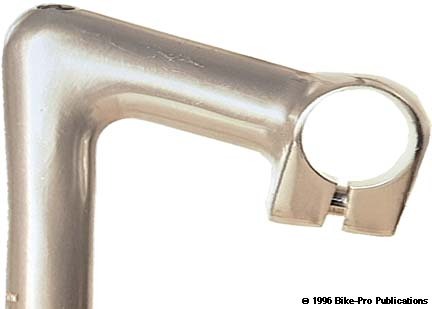 Made in Italy, the Cinelli 1A stem is one the most widely recognized road stems ever made. At the time of it's original release, it represented a major improvement in the quality that cyclist's could expect from stem manufacturers. 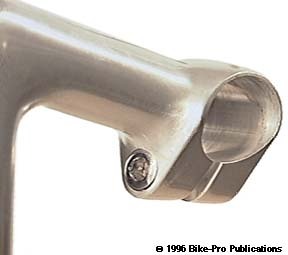 The stem is forged from aluminum in a single solid forging, then machined and polished. The quill is bored from the bottom to a depth of 115mm, leaving a wall thickness of 4.5mm for the section of quill that is exposed above the headset. At the base of the interior the hole flares from the 4.5mm thickness down to 1.8mm thick. This reduction in wall thickness is to permit the wedge to push strongly against the steerer tube. 27 millimeters from the bottom, a 4mm hole is drilled front to back through the quill. The quill is then sawn from the bottom straight up to each these holes leaving a 3mm kerf. 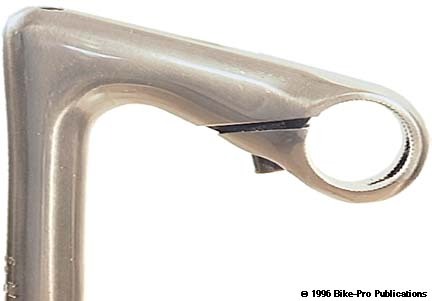 This cut, creates two "legs", that the wedge splays as it's threaded up the expander bolt, and it is these "legs" that press against the steerer tube, holding the stem firmly. The quill is bored from the top with a 12mm hole, that creates the cradle that supports the expander bolt head, leaving it flush with top of the stem. The binder is drilled through with the characteristic 26.4mm diameter hole for the handlebar. 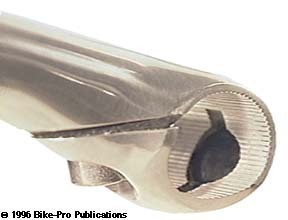 Cinelli bars have always had a slip-sleeve on the center of their bars, building the outer dimension to 26.4mm. The front of the binder is drilled through for the binder bolt, leaving an extra recess for the for the bolt head to fit elegantly into. There is a second drilling from the front to create a small notch, that a "key" on the bolt head sits into, preventing it from rotating as the rear nut is tightened. The rear of the binder bolt area is bored delivering a small recess for the head of the binder nut to lay into. The bottom of the binder is then cut through leaving a 3mm kerf that creates the cinch system. The final stage of aluminum work is the immaculate polish done to clean all external forging marks, producing a smooth pearl-like satin finish. One of the differences of this stem was the "hidden binder bolt". Up to this time it had been acceptable to leave the hex head on the bolt exposed at the front of the stem. 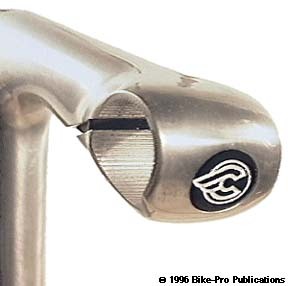 Cinelli took a different approach by using a flush faced head on the bolt, with a notched key to hold it in place, as you turned a nut with a hex head from the back of the binder to tighten your bars. This left a very clean look, and at least in the mind of the rider, reduced wind resistance from the stem. The bolt brought the simple elegance to the stem, and elevated the art of stem making. 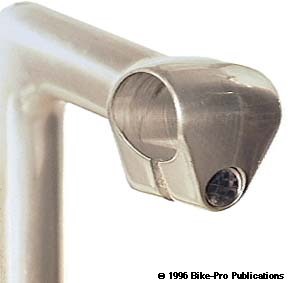 The binder bolt and nut are made of chrome plated steel, because the nut would rotate against aluminum Cinelli inserts a thin brass washer between the nut and the stem, providing a lubricated surface for the nut to slide on. The binder bolt, nut and washer weigh 14 grams. The expander bolt is made of chrome plated steel, with 7mm x 1mm pitched threads, a 135mm length, and has the same thin brass washer where the steel head rotates against it's aluminum seat. The wedge is cast of steel, in a conical shape so that as the wedge is drawn up, it applies sloping even pressure to the bottom of the legs. The expander bolt, wedge and washers weigh 60 grams. The Cinelli 1A is made only in the 1", (22.2mm) diameter, with a -15 degree rise, and comes in 70mm, 80mm, 90mm, 100mm, 110mm, 120mm, 130mm, and 140mm extension lengths A Cinelli 1A stem in the 80mm length weighs 258 grams. The Cinelli XA is rather similar in styling with the 1A, but has dramatic changes to the binder. The XA, like the 1A is cold forged of light aluminum alloy. The solid quill is machined exactly like the 1A, boring, sawing, drilling for the bolt, please read about the 1A for the techniques, and steps. The binder on the XA is fashioned more aerodynamically, with the binder bolt cinching from the bottom side up into threads in the extension, in essence "hiding" the bolt. The binder is drilled with 26.4mm diameter hole for the handlebar. Again, this 26.4mm is the unique Cinelli size that Cinelli makes their handlebars to. The hole on the inside, is then knurled, producing many small gripping peaks that lock onto and hold your handlebar. At this point, the stem is revolved so it's upside-down, where it's drilled from the underside, up at an angle to make the recess for the binder bolt head and travel hole for the bolt itself. The hole is tapped for the bolt threads, then a 3mm saw cut is made to open the binder and create the cinch system. Cinelli provides a plastic spacer that fills in the 3mm, cleaning up the appearance further. The binder bolt is made of nickel plated steel, has a 6mm hex head that has 12.8mm outer diameter, is 20mm long, with 8mm threads by a 1.25mm thread pitch, and weighs 13 grams. To add distinction to the stem, by making their logo visible on the front, Cinelli drilled the very front of the binder, creating a recessed hole with slip-notch fittings for a Black plastic logo/disc that snaps in. Before the logo is snapped in, the stem under goes a micro-fine polishing job that leaves a fine spun satin surface, over the entire exterior of the stem. This stem uses exactly the same 60 gram expander bolt and brass washer as the 1A stem, in exactly the same way, (wedge forces legs against steerer). The Cinelli XA is made only in the 1", (22.2mm) diameter, with a -15 degree rise, and comes in 80mm, 85mm, 90mm, 95mm, 100mm, or 105mm extension lengths A Cinelli XA stem 110mm, 120mm, 130mm. In the 80mm length weighs 256 grams, an 85mm version weighs 267 grams.